Several studies have observed an increased risk of respiratory infections in subjects doing heavy physical exercise. Vitamin C has been shown to affect some parts of the immune system, and accordingly it seems biologically conceivable that it could have effects on the increased incidence of respiratory infections caused by heavy physical stress. 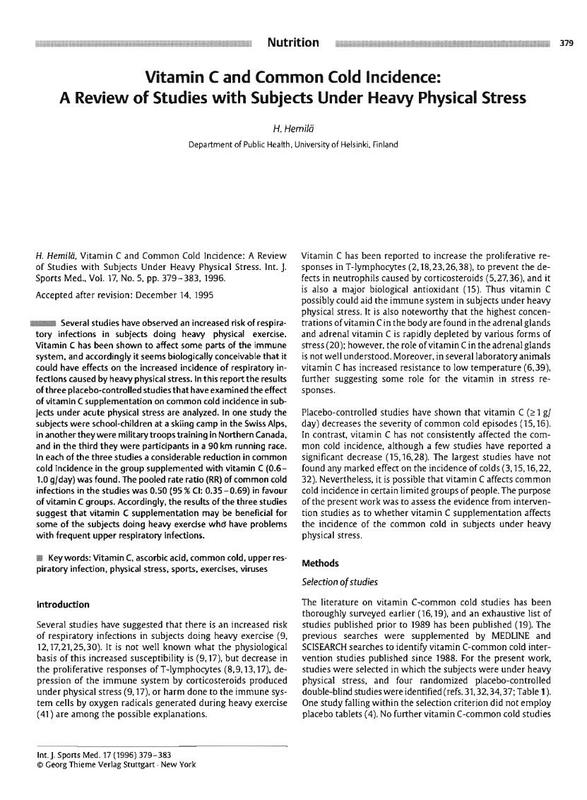 In this report the results of three placebo-controlled studies that have examined the effect of vitamin C supplementation on common cold incidence in subjects under acute physical stress are analyzed. In one study the subjects were school-children at a skiing camp in the Swiss Alps, in another they were military troops training in Northern Canada, and in the third they were participants in a 90 km running race. In each of the three studies a considerable reduction in common cold incidence in the group supplemented with vitamin C (0.6-1.0 g/day) was found. The pooled rate ratio (RR) of common cold infections in the studies was 0.50 (95 % Cl: 0.35 - 0.69) in favour off vitamin C groups. Accordingly, the results of the three studies suggest that vitamin C supplementation may be beneficial for some of the subjects doing heavy exercise who have problems with frequent upper respiratory infections.